I still can't believe I haven't read this one yet! I can completely understand why you didn't like Bri, but I'm happy her character did her job. That's an impressive feat. Her story was one that will inspire young women to create spaces in male dominated spaces, especially creative spaces such as the music industry. One particular aspect I really admired about Brianna was her determination. It's a great read and I really enjoyed all the pop culture references. I'm really interested in this one but yours is the first review I've read. I only saw the movie for The Hate You Give but I enjoyed it. I haven't seen the film as yet but as far as the two books compare, The Hate You Give is a much more passionate and moving read. I just found Brianna quite frustrating with her inability to listen to others and believing she knew better. I still need to read The Hate U Give, though I do own it, so hopefully soon. I'm curious about this one too. It does sound like Brianna can be a bit difficult to like, but there are definitely characters - and people - like that, so I'm glad that it didn't take much away from the overall book and story line. I'd recommend reading this one first actually Lauren to avoid disappointment. In comparison, this isn't nearly as great as her debut, it was lacking passion mostly and Brianna was unlikable as a main character. Still a great read nevertheless. I still need to read this one. I'm sorry to hear that you didn't like the main character. That always makes it hard for me to enjoy a book so I'm curious to see what I think of her when I read it. I'm curious too Suzanne and would love to see what you think of it. I think it was mainly her lack of respect for her mother, considering all she does for her. She's still punishing the woman for her former drug addiction. Her mother is such a brilliant woman and was one of my favourite characters. Good review. I've still not motivated myself to pick that book back up from the 'I will get back to reading this eventually' pile. I struggled to connect with Brianna. I was hoping to connect with her more as the book went on but it's probably part of the reason I've not gone back to it yet. I do think it's one I will have to try and pick up again because I do want to read this but your review pretty much confirms that there are reasons I haven't picked this back up yet. I found it really difficult to empathise with her, especially considering how she treated her mother, a woman who did what she thought was best for her children and returned when she was well and able to care for them again. She seemed to show little sympathy for her and referring to her mother as her first name as well. 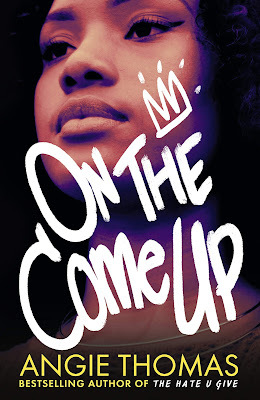 I'm wondering if On The Come Up might have been written first and intended to be her debut as it didn't feel as polished. I’m scared to look at how long the library waitlist for this book is. The waitlist for The Hate U Give was the longest I’ve ever seen. Great review! Perhaps they might be better prepared this time and have a few copies in hand. Hopefully you can get your hands on a copy soon! I just finished this myself and have a review coming up. Good point about Brianna and how she treated her mother -- I think i thought of that as her emotional protection in a way until she found her way back to understanding her mother again. I thought the same in the beginning but with the secrecy and not listening to the advice of those around her, it seemed more like Brianna was being disrespectful and punishing her mother for leaving. I still enjoyed it overall, I had just wanted to connect with Brianna and her narrative earlier. It was a wonderful read Ailyn and one of the aspects I really enjoyed was Brianna's lyrics scattered throughout the narrative. It took On The Come Up to another level. Oooo, this novel sounds amazing. I still haven't read The Hate U Give because I'm afraid of the hype. Like the 8 Mile comparison. I'd recommend reading On The Come Up before The Hate U Give, only because this one feels like a debut. Still a great read but to compare protagonists, Starr Carter from The Hate U Give is brilliant while Brianna takes a while to warm to. Really looking forward to seeing what you think of both of these Vivien.